[New York] - October 29, 2011 - TFL, a globally operating company offering specialty chemicals for the leather industry, has published their Autumn/Winter 2012/2013 Color Trends. TFL, divided their Autumn/Winter 2012/2013 Color Trends into "Wearing" and " Living", devoting a section to each within their publication.
' Wearing' comprises inspirations and color trends for garment, footwear and accessories. The 'Living' section features all colors that will decorate the season's interior design. 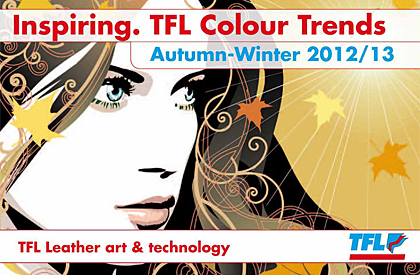 Please DOWNLOAD TFL Autumn/Winter 2012/2013 Leather Color Trends for more detailed trend descriptions and color codes. For billions of years mother nature has been working 24 hours a day. So why not adapting this approach to companies? To create, for example, fashion collections that recreate their own colors, iridescence and texture and are at the same time able to work in different situations - without any problems. Attention should be drawn to leather that embraces us like a soft blanket of fur, where nubuck calf coats with natural micro designs sink into our hands. A geometric pop art motif and countless variations of textile designs including stripes and cashmere, as well as large and small squares move trough next winter's living collection. The whole interpretation of this style lies in the elaboration of sartorial flair. The loyality towards a sartorial artist is somehow complex; it occurs in different situations where someone invades our privacy, touching, judging. After having overcome the power of perplexity, it becomes a perfect silhouette. TFL is the only company of its size exclusively focused on solutions for leather manufacturing. TFL's business activities consist of the development, production and marketing of specialty chemicals such as tanning agents and dyestuffs, with which their customers, the tanneries, create leather. In addition, they support their customers and their business partners with tailor-made solutions for the whole leather manufacturing process - from beamhouse through to finishing. Please note: Color rendition impaired due to printing. For subsequent adjustments please use the corresponding Pantone color system.